Hasyudeen: The German "Pasar Tani"
Learning is part of living. We learn through many ways, formally in classes as well as through observation and reflection. Nobody should feel that he or she is knowledgeable enough for not to learn anymore. Germany is a developed country. It is a country known for its passion for efficiency, perhaps rooted in its industrial culture. Many global brands such as Mercedes, BMW and many more originated from this country. 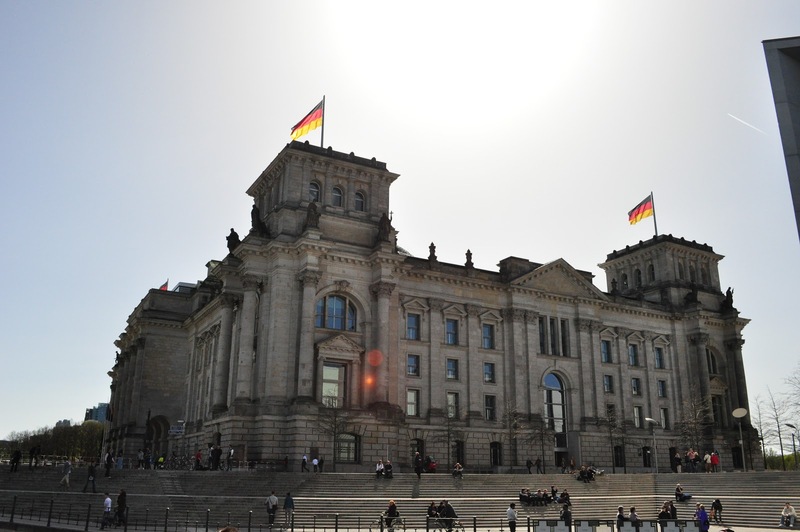 The current hot issue in Germany now is about the future of nuclear technology. Given what is happening in Japan, people are very concern of the risk of another nuclear disaster while seeking alternatives to satisfy Germany's hunger for energy. In fact, countries like Germany are so into renewable energy while we still believe it is our entitlement to keep on burning our subsidised fuel without being concern about energy efficiency! 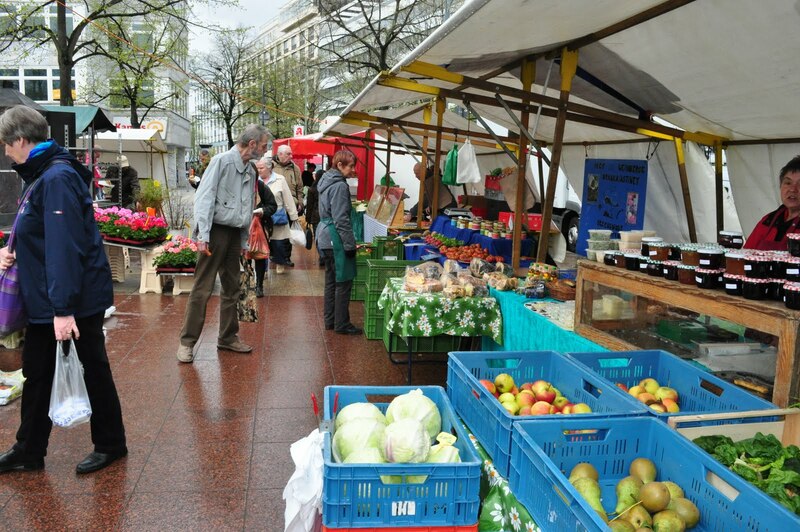 Why am I discussing about the Germany's Pasar Tani or agriculture market rather than technology? Germans are human too and food keeps human alive. Observing their version of Pasar Tani provides us with the opportunity to understand more about their culture and values. 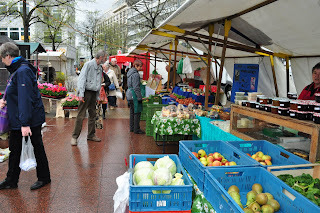 There is no surprise in terms of the kind of stuff that we can find at their agriculture market in Berlin, mainly foodstuff like what we have here. 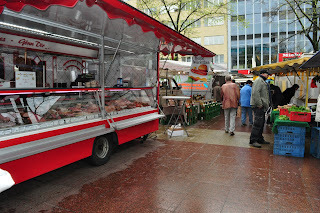 Off course we can find sausages, something that is consumed widely in Germany. What matter most is about the cleanliness, something that we have not picked up here. 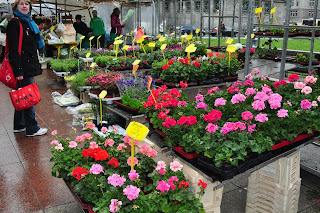 Everything is dry and clean and everyone seems to be very cautious to maintain the cleanliness of the market. Lesson number one is that it is possible to have a clean agriculture market, not wet and stinky like ours. Lesson two is that cleanliness is everybody's business, not the responsibility of local government officers only. These are the basic observation which is common in developed countries. Developed in terms of mindset, not just having tall buildings and long stretch of highways. So, if we in the east feel that we are special, it may not be so until we learn more about doing the basic thing like keeping our environment clean, even as Pasar Tani. Congratulations. You found time to experience the German 'passer tani' and you also found time to share the experience. Apart from the fact that our own pasar tani is as you mentioned...not so clean and rather stinky, I feel that most have even lost their identity as 'passer tani'. I am a regular Saturday morning visitor to the Pasar Tani in Taman Melawati. There, it is more than just a pasar tani as there are stalls selling clothes, toys and cheap end electrical appliances....and occasionally even a motor car is being placed among the 'agricultural stall' for a sale promotion. An 'integrated pasar tani' would be an apt description. And, the way 'couldn't care less' visitors haphazardly park their cars and motor cycles .....this has to be another story, another day!